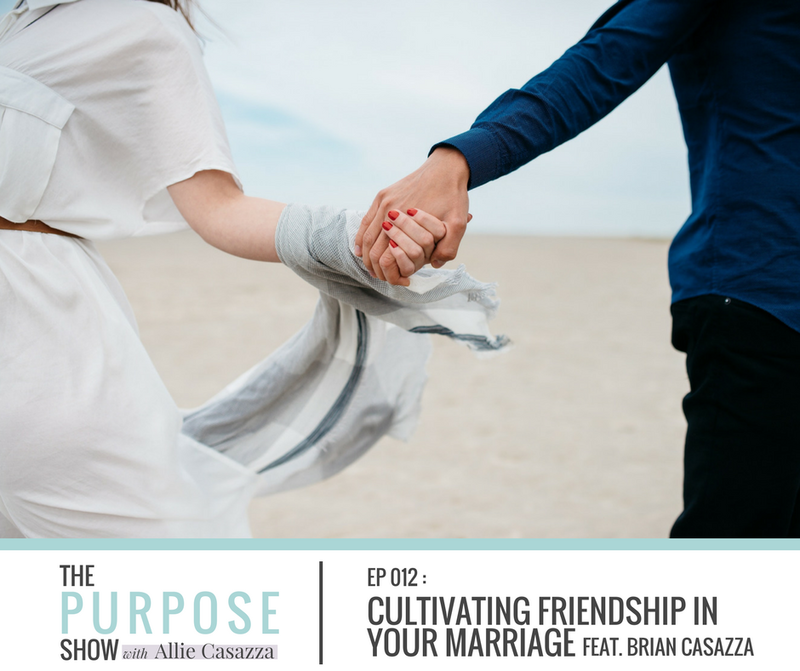 Allie is joined by her husband, Brian to discuss Cultivating Friendship in Your Marriage. Any couple can cultivate a friendship with a little work. Marriage is already work, so why not focus on working to be friends with your spouse. How do friends act? What do they do for each other? How are they with each other? They go out for coffee. They talk about their day with one another. They intentionally spend time together in order to learn more about each other. If you are like this with a friend, why should you marriage be any different? That is your best friend! Allie + Brian get it. Life happens. Things happen. When you have friendship in your marriage, it is such a great “fall back” to know you have your best friend by your side for the worst situations, scariest nights, and stressful days. The importance of treating your significant other like a friend. How keeping their friendship strong creates deeper intimacy. What “common ground” looks like in their relationship. Ways you can take time to learn everything about your significant other. Especially as years go by + things change. Hi guys! Welcome to Episode 12 of The Purpose Show. I have Brian here with me today. ALLIE: We have four kids and we don’t have any help today. We have our oldest in there. She is almost 9 and she is in charge. We give her a dollar when she helps. They are watching Netflix and have a snack. We finally got them settled and we come out here to record. Brian decided this was a great time to put some kind of snack in his mouth that sounds like Pop Rocks. Can you explain what this item is? BRIAN: It is a “pre-workout thing” that happens to be like Pop Rocks. ALLIE: Yeah, you put it in your mouth. It sizzles and makes Pop Rocks sounds and is really loud. So, we got everyone settled and we had to sit here for two minutes for the Pop Rocks sound to stop. So, the kids are settled, the Pop Rocks have stopped and I think we are good now. 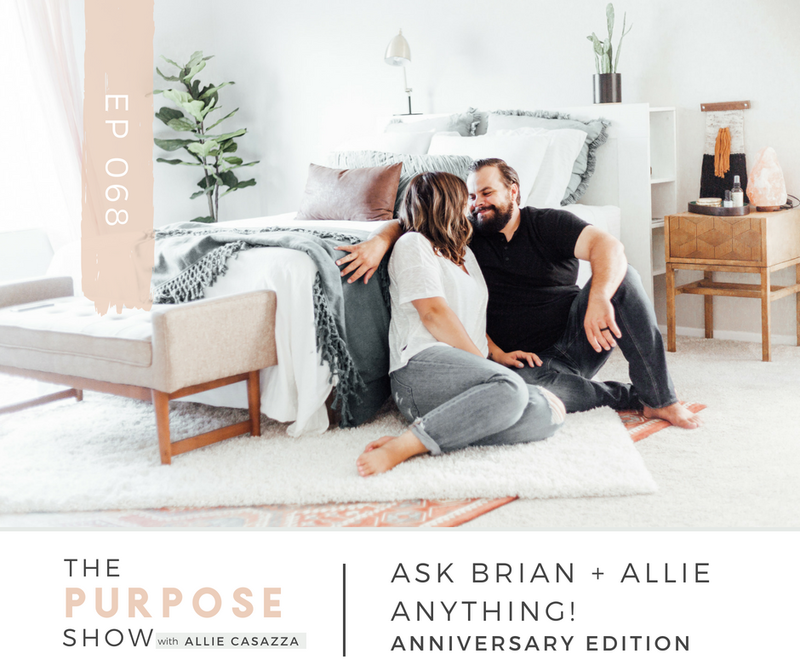 ALLIE: In today’s episode, we are answering a question that we get a lot on Instagram about how to have a friendship while being married. We have not always known how to talk about marriage. I feel like power couples who teach about marriage and are really great about sharing marriage, seem to have it all together. They seem to never argue. It seems like they should be talking about marriage. We have discussions and disagreements all the time. We are just a really real couple. I have never really known where we stand in terms of sharing about marriage. I never want to come across like we have it all together or we never have problems. I definitely never want it to feel or sound like that. I think it has been a struggle. We can share some other time about our complete story. The beginning of our marriage and our story was just littered with difficulty. We had such a hard time. We got married really young. It was just really hard. We have had totally awful fights. Immature things caused a lot of big problems in the beginning of our marriage. I feel like it is a REAL marriage. It is a weird feeling to be teaching something you know you are not the best at. I just want to start out with a super humble opening. BRIAN: We are not perfect. ALLIE: No, but we really love each other. We do have the friendship going for us. Our friends that are close to us in real life tell us that all the time. So, this is one thing I am really happy to talk about. When it comes to creating an air of friendship in your marriage, we jotted down a couple of things we knew we wanted to bring up in this episode. The first thing that we both agreed on was that we have kind of always been friends. That’s how our relationship started before we even dated. BRIAN: Right. We were in the same “friend groups”. We were just all friends with each other. ALLIE: We were in the same circle. BRIAN: That helped. We were spending time with our other friends, hanging out. We were already just good friends. ALLIE: It wasn’t like we just met and you asked me out. ALLIE: Since Junior High. We didn’t start dating until the last couple of weeks of High School. So it was there already. We weren’t super close. We didn’t hang one-on-one. But we knew each other’s personalities. I knew little things about you, your background and family, from being in the same circles as you. We just already knew a lot about each other. BRIAN: I knew your brother. We were both in band. That helped out. ALLIE: I think also we have things in common and we obviously like each other. I think sometimes other couples maybe don’t feel that way and maybe you could work on that. BRIAN: Or something as easy as this: I remember when we went to prom. We were sitting in the back of the limo. That was when we had mixed-tape CD’s. You were putting in music. It felt special because we liked a lot of the same music. We liked a lot of the same things. That was always easy for us. ALLIE: Right. A lot of couples meet that way. Try to remember what you had in common. Those things have changed. We don’t like that same music. We have really different tastes in music. But the point is going back to what we had in common in the first place. What did you like about each other? How you can rekindle that or reconnect in that way. We met in Junior High School and got married when we were 20. Now we are both about to be 31 in a couple of months. It has been a long time. That’s a very pivotal, crucial time in a person’s life. It is like a baby’s first year – they change way more in their first than going from 3 to 4. Your 20’s are so key and we changed a lot. There were definitely some scary times. So we needed to revisit what we have in common. What do we enjoy doing together? For example, we are both “dinner and conversation daters.” We don’t really like to do adventure dating. BRIAN: Some of our friends like to go do stuff on a date. I would rather just sit and talk with you. Spend time with you. Because from the beginning I have always liked making you laugh. Although you claim I am not the funny one. I like telling you jokes, making you laugh and having fun with you. ALLIE: I am the funny one, you guys! BRIAN: You are sarcastic and funny in a certain way. I like when you get like that. It is nice because I can easily have a conversation with you. I think about how I talk with my friends. We joke and talk about things in a certain way. I feel like I have that with you. I can talk with you like a friend, not just as my romantic partner. ALLIE: Right. We are doing life together and it’s a partnership. It is. But we also have an aspect of friendship. Although we have different tastes in music or we like different movies, we still have things in common like we both want the same kind of date night. We have no complaints going to the same restaurant every week and just talking and catching up. We both love to do that. That is something we have in common and ties in with our friendship. BRIAN: When you said how we like different movies and music, it made me think that there is some compromise. I am not going sit here and say, “no, I only want to watch this movie. We are only going to do this.” And you are saying the same thing - that I have to only watch the chick flicks or romantic movies that you want to watch. I just feel like we are both good at compromising. ALLIE: We try to find ones that we both like. We both like “Love Actually” so we will both watch that together. There are also movies that each of us like and the other will compromise. We find compromises in each other’s favorite things and do those together. We have also struck a balance that we both like watching “shows”. I don’t really like watching movies that much; it feels like a lot of commitment for some reason. But we will sit and binge watch Netflix shows together. Find your common ground. It is OK to hate something that the other likes, but find some common ground. That’s what friends do. That’s what friendship is. BRIAN: Right, you do that with your friends. ALLIE: You might be feeling that you didn’t have that start. “Allie & Brian met so young and started as friends.” We have talked about this with other couples who have made this comment to us. Any couple can cultivate friendship in their marriage with a little work. Marriage is already work anyway, so why not focus on working to be friends with your spouse. Let’s get real for a second. Life is so crazy. Things happen. PMS. Having babies. Gaining weight. Feeling like crap. Romance is not something to base a marriage on because it is so fleeting and not always there. It is such a special thing to know that when you have friendship in your marriage, it is such a great “fall back” to know you have your best friend by your side for the worst situations, scariest nights, and stressful days. Anyone can cultivate that. So be encouraged. I don’t want you guys to feel like we are just super lucky. It’s not like that. There have been times where we had to work on our friendship. Recreate it because it was ruined by words, situations, or just growing apart a little bit. The next thing too is just taking time to learn everything about each other. This might sound a bit cheesy. BRIAN: Especially, “I feel like I have known you for this long, so I know everything about you”. But I have realized recently that we like doing those fun quizzes where you find out things about yourselves. You would think those are for someone you just met; that you want to find out about them. But being together for all of this time, I feel like things change. It is fun to refresh and go over those things again. I feel like there are some new things I have learned about you that have changed and it’s fun to go over that again. ALLIE: In an upcoming episode we do one of those “conversation starters”. We know what our answers would have been six years ago but it may not be now. There is always growth and change with each other. It’s fun to have those conversations. I think part of that is we create a lot of alone time together. We have been really religious about having date nights outside of the house. Or after the day is done, sit down with each other, talk, away from the kids. That has brought out the desire to play the quizzes, talk with each other and have conversations. ALLIE: The next thing is when you have to spend time apart. We were apart all the time. We were apart A LOT. All day. Sometimes you would take work trips through the night. I would be asleep when you got home. I would be asleep when you would leave in the morning. We wouldn’t see each other much. You worked 6 days a week, 12-14 hours each day. It was so hard for us. In that time, it was really important to connect. Talking with each. Texting with other. Sharing jokes. Sharing little bits of our days. BRIAN: That communication constantly throughout the day helped me to feel like I was right with you. I know it could be hard if you were at a job that you couldn’t do that. Anytime I could take a lunch break, had a moment, I would text you. ALLIE: You would say, “Hey I am about to take my lunch do you have a minute?” I would get the kids settled on the couch. And we would Facetime if we could. And we just talked. BRIAN: Thinking about it, that definitely made a significant difference. If I would be in a situation or having a day that I couldn’t talk to you all day, I would feel frustrated or disconnected. ALLIE: And then it would be hard because you would get home late and we would be exhausted. It would be hard to connect. Take whatever your day looks like and try to apply that. There were days when I would stick a note in your lunchbox. Just a romantic note – “I am thankful for you, I love you” – just to connect in some way. Maybe you have a better schedule and can talk at night. Email. Something. Text. Leave a voicemail. It was just nice to connect whenever we could. BRIAN: I feel like the friendship part of a relationship is really big. I definitely think that there is a part to our marriage where not only being romantically in a relationship with you is not the only thing. It helps that is not only how our relationship started, but that we were friends. How do you talk to them? How do you spend time together? What kind of things do you do? I feel like having that piece of friendship in our marriage, also with being intimate and close, is important. ALLIE: Examples of that would be, “What do friends do?” They have coffee. They check in with each other. I think this leads us in to our last point. How do friends act? What do they do for each other? How are they with each other? Talking with each other about issues with tact and respect, like you would with anyone other than a spouse. It is easy to get comfortable and let anything and everything fly out of your mouth. BRIAN: Yeah, you get comfortable. That respect kind of goes away. You will let any emotion or feeling pour out onto the other person. Like they are an emotional punching back. A verbal punching bag. Throwing all of your junk out. I feel like that can hurt each other. ALLIE: But in a healthy friendship you could talk about what’s bothering you in a healthy way. We are very open with each other. But what we mean is the way you bring up an issue. Having a little more tact and respect for each other. I do want to say too that I think this has been one of the hardest lessons for us as a couple and one that I am sensitive with in our marriage. If Brian says anything, even if it’s in love, I just feel smashed that there is even a problem. On the opposite end, I am really blunt and have a hard time guarding my words. Just really honest. It will physically bother me. I will shake and walk around to hold in words. It physically bothers me to not say what I am thinking, especially with Brian, because we are so close. That’s been a really hard lesson to learn. I feel really happy with where we are right now with that. Of course, everyone has their bad days where you just fly off the handle. But typically, I think talking about issues with a bit more respect, maybe biting your tongue in the moment when you might not say it the right way, is good. This happened last night on my end. I was irritated. It was the end of the day and I was frustrated about some things that didn’t get taken care of. I knew that no matter what I said or how I mean it, I was not in a good place to say this well. To say it in love. To say it constructively. It is not about stuffing it down inside of yourself. You would have been happy to talk it out with me. You always want to hear my thoughts and always care about how I feel. If you knew how I was feeling, you would have said, “no just talk to me”, but I knew in myself that it would have been impossible for me to discuss it with you in a way that is constructive for our marriage. It is better and wiser to just wait until later. I ended up praying, taking a shower, and feeling better. We went to bed. And this morning I was totally fine and brought it up and said, “this is how I am feeling. It’s frustrating. I know that you don’t mean this and this is not your heart, so can we talk it out?” And the problem is worked out and fixed and is great. I think that is a good example of what we mean about handling things like you would with a good friend. With tact, respect, saying things in love. Maybe waiting for a better time. Not just flying off the handle and saying whatever you want to say just to be saying it and be unkind. I hope this was helpful you guys! I want you to be encouraged and not discouraged after you listen to us talk about our marriage. Not every episode reflects this, but a lot of them this month are about love and marriage. We just hope that you feel really inspired. That you have a bit more clarity on how to start creating an atmosphere of friendship in your marriage.